The likelihood is that you’re the mileage and travel expert for your family and circle of friends, so even though you’d never fall for this scam, you should be aware in case they come to you about it. Last year, people began receiving emails like the one above that was received by blogger and SkyMiles Geek, Rene over at DeltaPoints. These emails usually come in the form of a fake confirmation for some supposedly “recently purchased tickets” and contain instructions to click a link or open an .EXE attachment in order to view the ticket. The deception works when the recipient, concerned about receiving a confirmation for a ticket they never purchased, follows the instructions and their computer gets infected with malware. It’s obvious to you and me that it’s a fake email (apparently the scammers are to lazy to even produce any fake graphics) but to others (particularly elderly parents) it might very well seem legit. You can visit AA.com for more info. and MANY people seem to be getting this email. While we are all savvy travelers, just be careful! Its always amazing to me how low tech these things end up being. I am suspicious of emails I get that I just requested. LOL! @ DealsWeLike – That’s scary. Glad your Dad checked with you first. Thanks sharing the story! @ Mike – Great advice. Thanks! About the spell check, I believe is intentional. If you pay closer attention, I bet you ca find typing errors in any fake message you get… Maybe this is a catch to “legally” avoid any punishment. I keep receiving these type of messages very often, regarding airlines, banks, e-commerce sites, things that I “won”… In every message there is at least one spelling error. do you know of a letter from “American Airways” stating “you have won 2 round trip tickets? @ Fredd – It’s a new scam. Unlike some of the previous fake emails, this one looks very legit. AA recently updated their website to warn people about it. Thanks for bringing it up! I got one of those emails today. 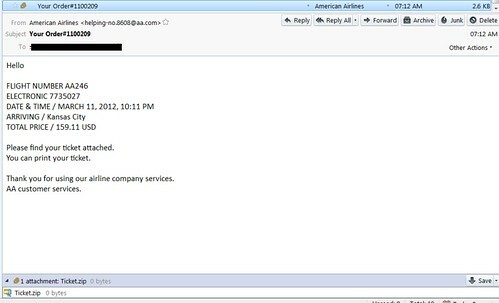 I also reported it to American Airlines and to webmaster@aa.com — then deleted it and ran the virus scans.